Click “Our Season of Pig” under Categories at right to read past installments. 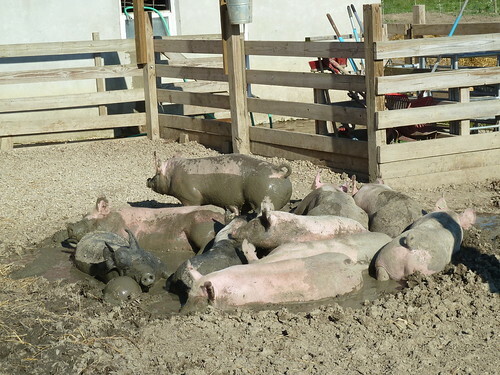 We washed them, a somewhat quixotic effort since pigs have a habit of fouling themselves just as you get them clean. The big unspoken joke of all this is that you’re competing for an award for showmanship when your animal’s idea of on-stage behavior is blithely pooping a continuous stream the whole time you’re smiling at the crowd and they’re applauding. You can see why pig-raising countries like Spain invented Dada and Surrealism. But we got them clean enough, and set them up in their pens, decorated with pictures and ribbons. 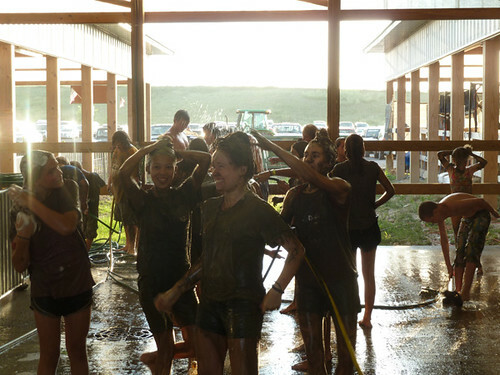 Then the kids began feeding some of them high-fat foods like cake mix to get their weight up for the official weighing-in the next day, while others (who were too close to the top of the weight class) watched and squealed angrily at being deprived. 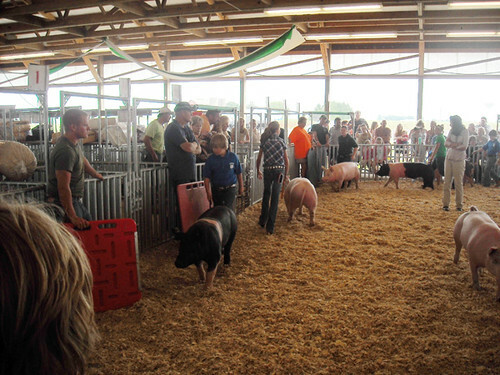 Wednesday there were two shows— one was to judge the pigs, one to judge showmanship. Frankly, I have no idea what the distinction is with pigs; in both cases, the pigs just run where they want, and the kids chase after. (With lambs, there was at least some degree of walking them like a dog.) 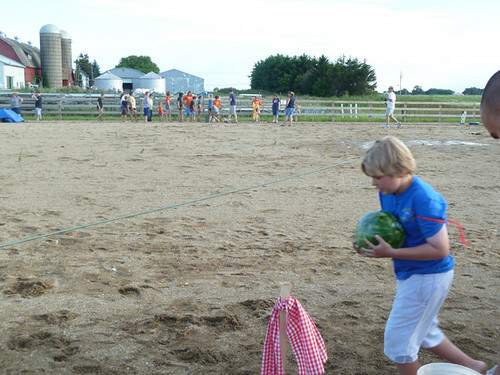 This was the judging among the 4H clubs; then there’s the open show judging on subsequent days. Lots of chances to get ribbons is the point, I guess. 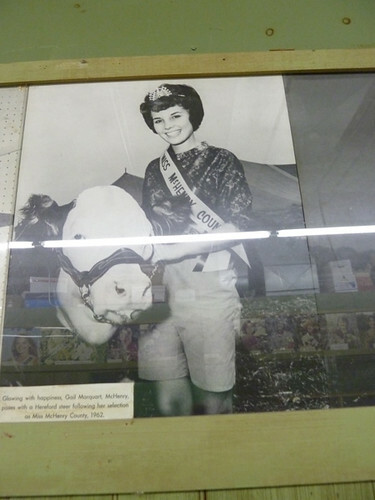 The same judge, surprisingly not a gravel-voiced old rancher but a serious young woman, judged both. She judged six different weight classes, picking a champion and reserve champions in each, justifying her choices with language that combined cool matter-of-factness about these animals being product with a kind of aspirational language that sounded like we were trying to help them get into good schools. Her favorite words seemed to be “practical” and “everyday,” as if pigs were hairdos or sensible pants. Liam guides Thor around the ring. 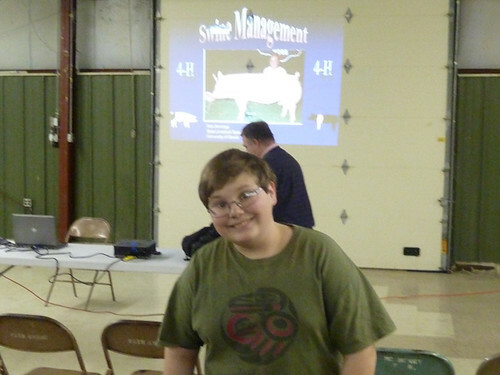 After a couple of weight classes we noticed a definite pattern— our club’s pigs usually seemed to come in dead last. I asked Julie, our club leader, why that was. She said part of it was due to our not keeping their weight up during the day of transportation and arrival; they didn’t eat due to stress and heat, and many of them lost weight rapidly. But the other part, she said, was that most of the others had probably fed their pigs Paylean, a supplement commonly used for show animals that’s basically steroids for pigs. 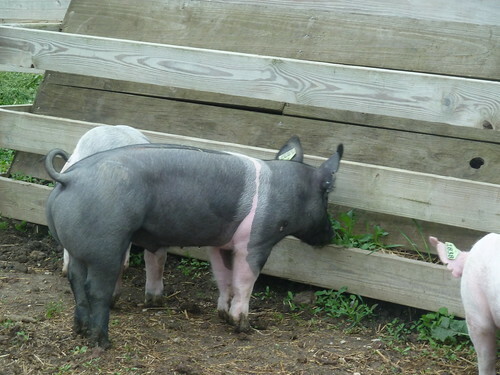 It gives them good muscle development for the show, but the price is that it turns the meat mushy— and if you’ve eaten pork that struck you as soft and spongy, a supplement like Paylean is probably part of the reason. This is when I’m glad that, for all that we work hard and want to do well, it kind of doesn’t really matter so seriously in our lives that we’re tempted to use modern industrial-farming practices like this. 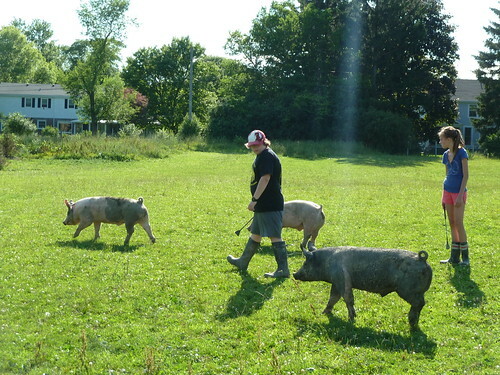 If we come in last for following some principles about raising the pigs a little more naturally, that’s not so bad. 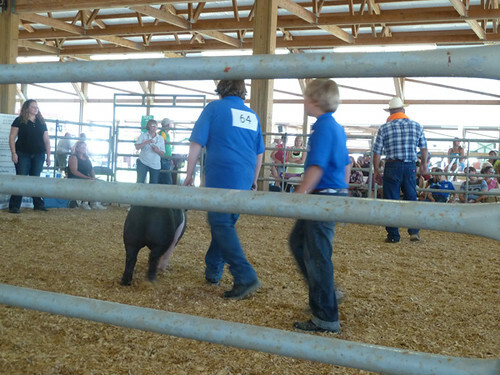 Showmanship followed and the judge hardly even seemed to look at our pigs, or our kids; we knew we didn’t meet her industrial pigs-as-product standards, and again we came in low in the group. 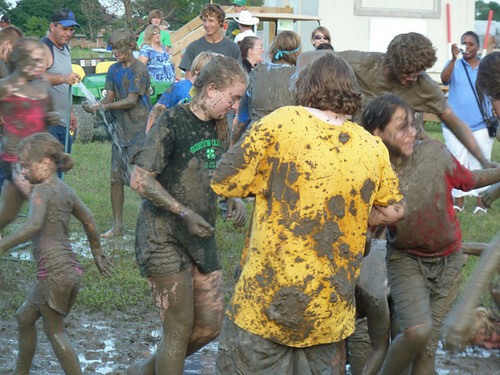 But the kids didn’t seem to mind; it’s more about the fun of being together at the fair than it is about winning. and running backwards around the cows. 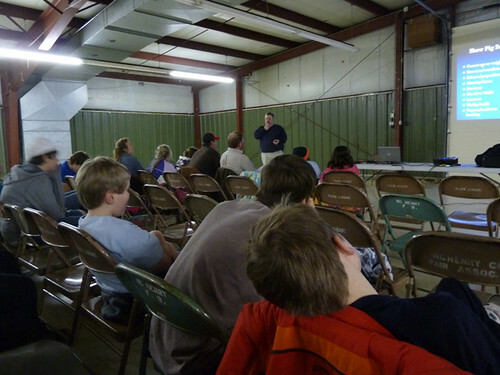 Saturday was the auction. 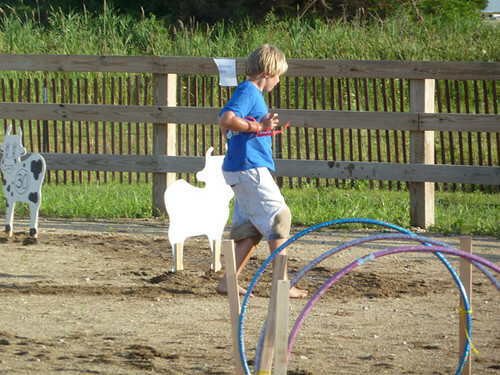 Unlike with the lambs in past years, with pigs again you just kind of chase yours around the arena. 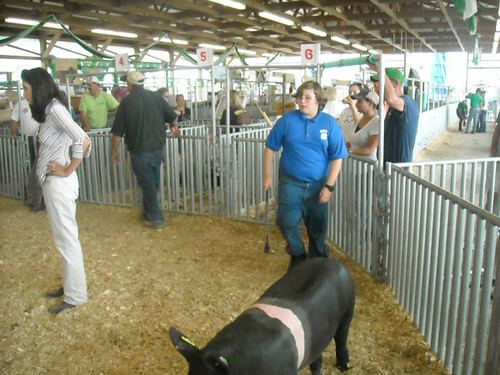 Pigs were last (after cattle, goats and lambs) so we had plenty of time to observe, happily, that prices were up again after being pretty low last year. Where cattle prices were in the dollar and something range last year, this year it was more like three dollars and something. Part of this might be that buyers are less spooked by the economy than they were last year, but part of it was also that the various clubs and the fair were making a more serious effort to cultivate buyers— there was a nice little reception at the back of the swine barn this year, complete with beer, for prospective bidders. 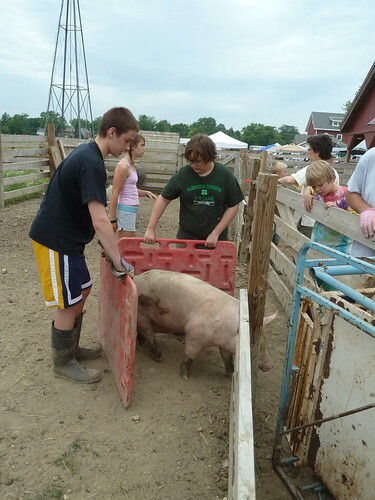 In the end, though, our pig was sold to the same man who bought two of our lambs (and donated them to a local food bank) in past years, and we got a good price, $3.25 a pound, which means we turned a modest profit on our kids’ activity. Add in the gold star that Liam got on one of his art projects— meaning he made the short list for Grand Champion in that category— and we had a good year. 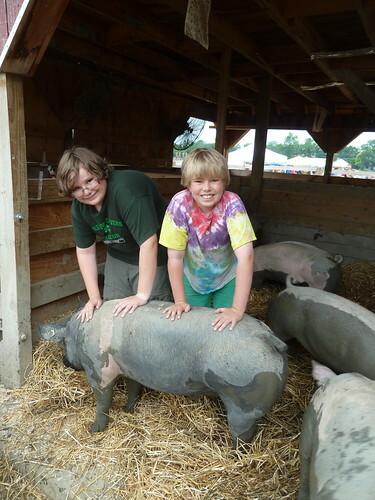 Although Myles made some comments about not shopping anywhere that bought our pigs for at least a year, in the end they weren’t bothered by a season of raising one of their favorite foods. 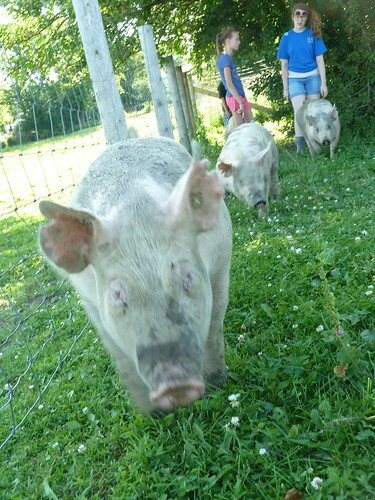 Although pigs are more intelligent and were certainly easier to handle than lambs, they’re still kind of alien, and the kids didn’t bond with these ominously large, black-eyed (except for Frank) creatures as they might a dog. 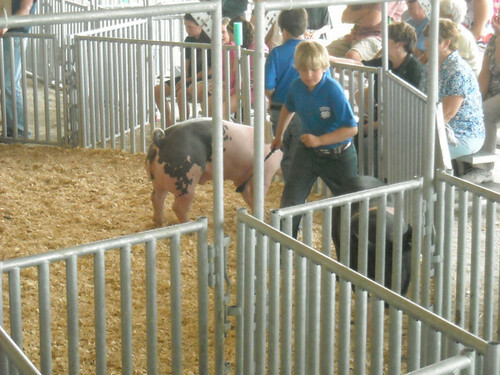 Myles even ate pulled pork at the carnival just a few hundred yards from his own pig. I don’t think this is bad in any way; only city dwellers can sentimentalize all animals as comparable to household pets. Farming has a vastly different view of livestock, and the symbiotic relationship of humans and domesticated animals is a natural thing which developed over millennia and needs to be reintegrated into our modern lives, not shunned or denied. I’m glad my kids have had a chance to discover it and understand it for themselves— including, recently, visiting a slaughterhouse and processing plant (though not observing slaughter, but engaging with it directly) for a future Sky Full of Bacon podcast. I feel I have done everything I can to prevent them from growing up to be food hypocrites, at least. 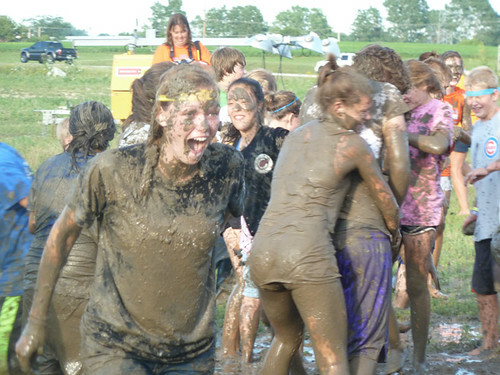 Special thanks and well wishes to our adviser, Julie Tracy, whose guidance and support during a difficult personal time is appreciated and treasured by all of us in the Glenview Clovers 4H club. 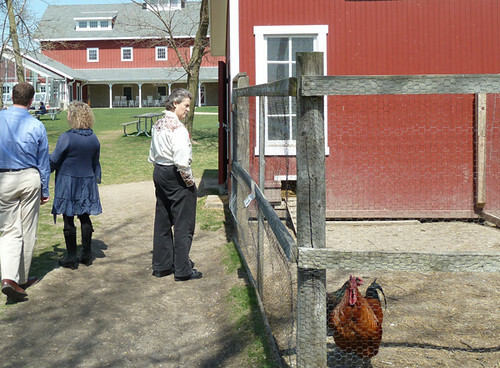 and exercising them by leading them out of their pen into a fenced field nearby. 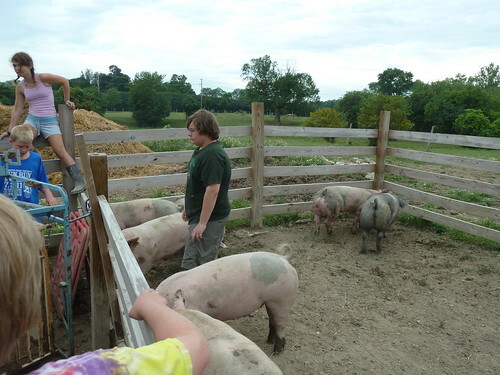 We use our Temple Grandin training to give the pigs pretty much only one choice of where to go, and once the first pig goes, the rest are curious enough to follow and run free. On a hot day, they love the hose. 4. Snoopy, Gip and Phin are getting overdrive this week- this will be hand fed to them so lets make sure it gets done and not done more than once a day for snoop and twice a day for gip and phin- we need to communicate with each other. 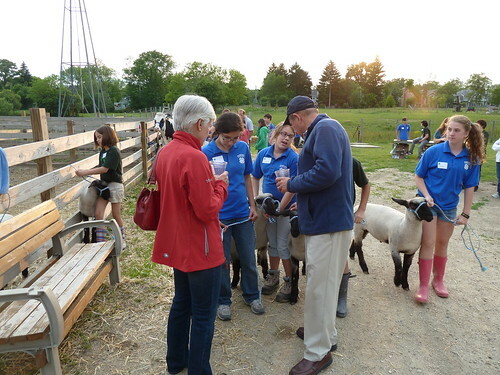 “That’s so cool, that you won a James Beard award,” one of the 4-H moms said to me. 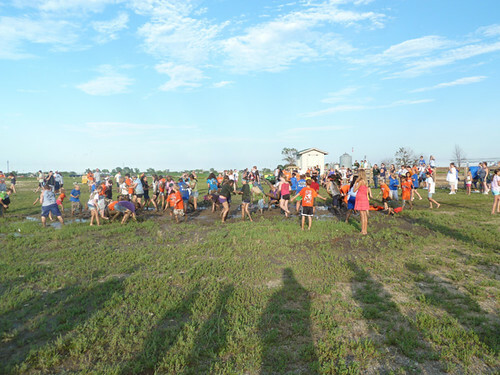 “And now you’re cleaning out pig poop like the rest of us,” one of the dads said. That about sums it up. If you have pigs, you have work to do. And it probably involves poop. The news started coming in emails from Julie a few days later, giving us all a taste of the hard side of farming. 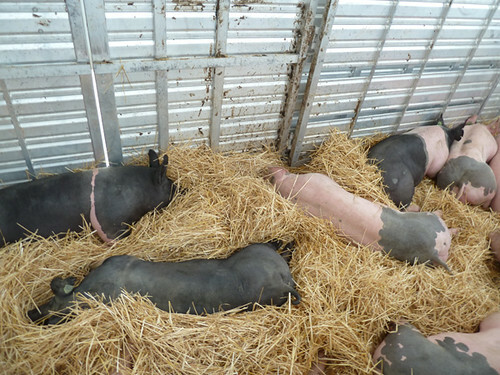 The pigs had lesions, possibly signs of an infestation, which kept getting worse as the pigs rough-housed in the pen and scratched each other up. They were dusted with insecticide. It didn’t clear up. The theory turned toward a staph infection called erysiperlas, even though they were vaccinated against such things. They were given penicillin. Unfortunately, today we lost Jessica and Jayne’s pig. He appeared well as of last night but was dead this morning. The vet came and autopsied him- he was quite ill with many infections throughout his organs. Most likely the cause was erysipelas. 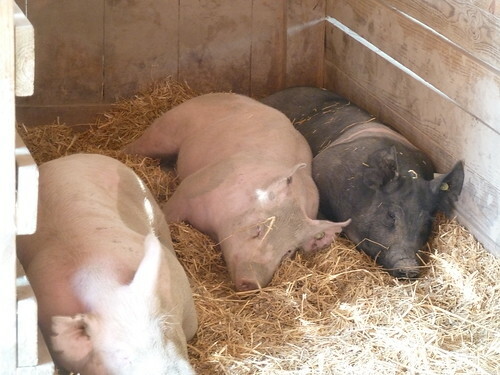 All the pigs have had penicillin and other antibiotics since arrival, but this infection overran the medicine. The doc gave all the pigs additional antibiotics and an extra boost of selenium. 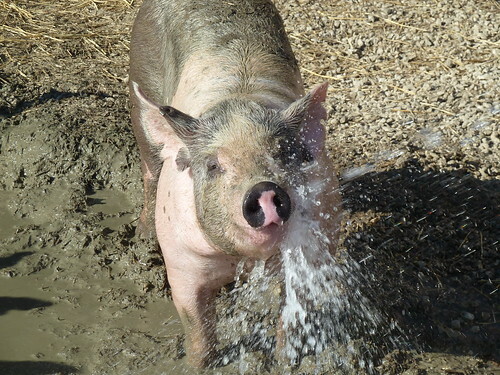 I am so very sorry this happened and hope you will not all become too discouraged and will be especially kind to our newest pig show persons who got a run of bad luck so early. 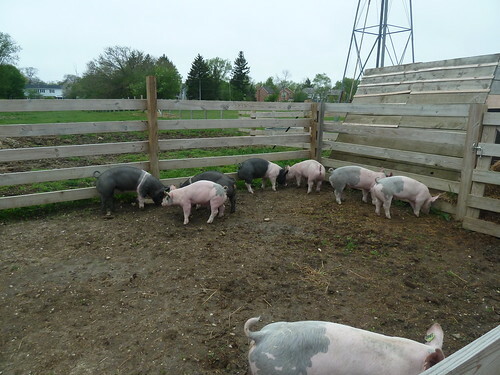 By the time we came to clean the pens, there were two new pigs— the heir and a spare, as Julie said— from the Foltzes being kept in quarantine for their first few days from the other pigs. Because one of them has blue eyes, Julie declared that we had to name him Frank. Then the question was, what to name the other? Dino, I said. I’m pretty sure the kids had no idea what either one of us were talking about. The quarantine (formerly the littlest pig’s bachelor pad, which only made the names Frank and Dino that much more appropriate) added a little wrinkle to our training in pen-cleaning. 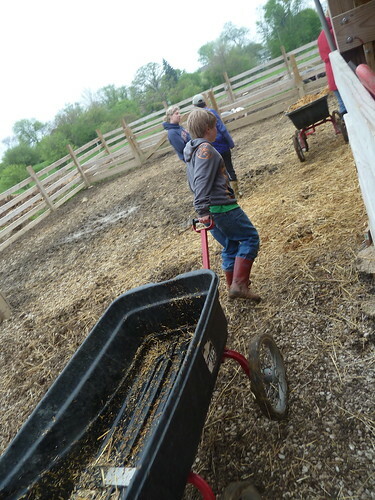 Because of this spring’s absurdly cold weather, the pigs were being kept in the sheltered pen to stay warm, but to clean the pen, we had to drive them out into another enclosure. Pis, unlike lambs, will happily go out given the chance, but getting them into the other enclosure is trickier. Pigs can’t be led, they can only be kept moving until they go where you want them to go, kind of like one of those games where you roll the tiny balls trying to get them all into holes. 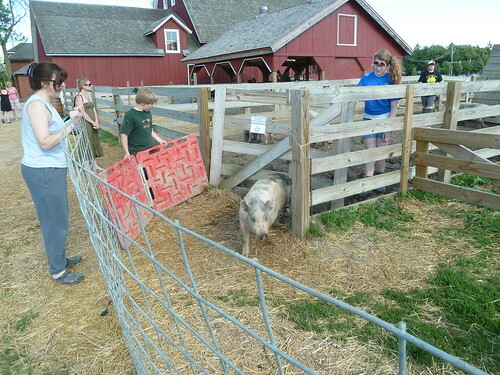 Temple Grandin’s comments about what encourages and discourages animals from moving came back to me as we used large plastic barriers to give the pigs no choice but to run into the enclosure. 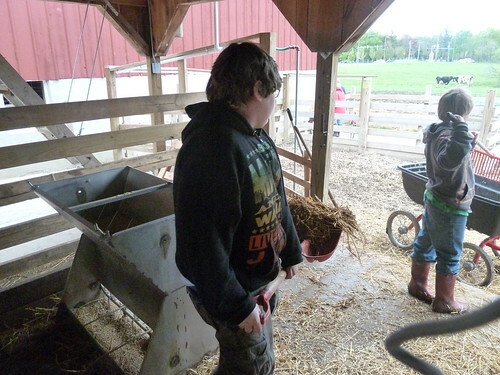 It was easy to see which corner the pigs had designated as the toilet, so we scooped up the clumpy stuff from that area and put down fresh sawdust and straw. 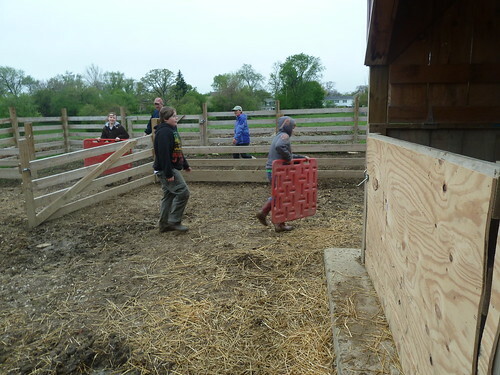 The girls cleaning the quarantine area had to be especially careful about lifting scoops of poop-soaked hay high enough to pass over the wall. 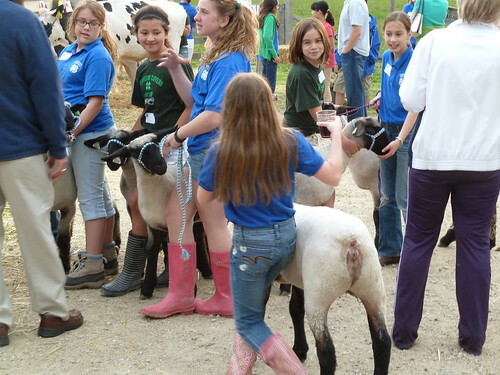 While we cleaned the pen, the lamb 4-Hers began training their animals. 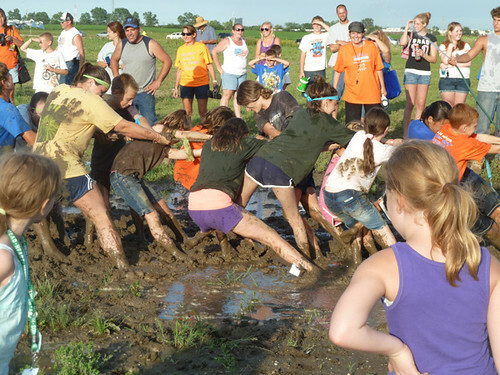 See if you can spot the difference between a bunch of lambs and a bunch of pigs. That title would belong to Temple Grandin, and if you haven’t seen the HBO movie about her starring Claire Danes, which won a small herd of Emmys, you should. I first heard of Grandin from an Oliver Sacks book maybe 15 years ago; a high-functioning autistic with a powerful visual memory but awkward human social skills, she came to realize as a student that her form of autism in many ways mimicked the ways animals experience the world— as visual and aural stimuli which are instinctively processed as threatening or soothing, and just as instinctively reacted to. Over time, despite difficulties with human social situations, by sheer force of will and insight she conquered an ultimate man’s world— the meatpacking industry— devising new ways to handle animals humanely and efficiently on their way to slaughter by creating an environment which directs them to slaughter in a way they find calming and non-frightening. 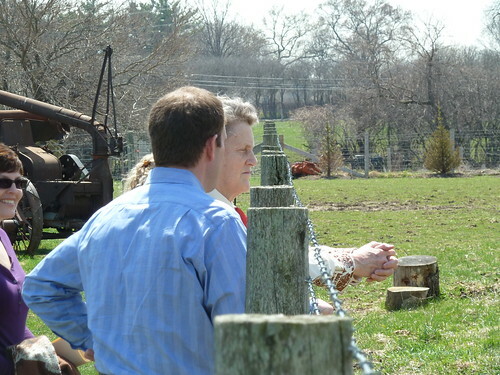 Her ideas and designs are in practice today at more than half of all US slaughterhouses. Not everyone easily sees her work as a good thing— an anti-meat activist could paint it as deceit to lure animals to death by exploiting their instincts to imply safety ahead, and she apparently gets plenty of those— but Grandin is a powerfully blunt advocate for the notion that we owe the animals we eat a decent experience under our care, and that any notion beyond that (such as that we might all stop eating meat) is simply pie in the sky which would get in the way of being humane here and now. As she said at one point, with characteristic lack of soft-pedaling, getting killed instantly by an electric stun gun is a lot better way to die than wolves dining on live sheep guts. For her, it’s that simple— probably, again, in part because her autism focuses her on immediate, real world responses to events, not utopia. 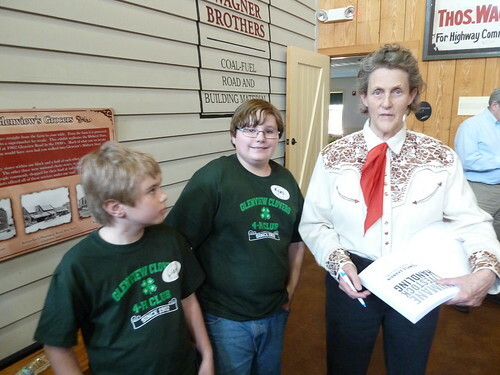 Grandin was in Chicago for the American Meat Institute conference; she came to Wagner Farm, where my kids are in the 4-H program, for an entirely different set of reasons. Julie Tracy, who runs the 4-H program, is a communications therapist often dealing with autistics, and has an autistic son who has been in 4-H in past years. As she described it in her introductory speech at lunch, at one point when she was having a difficult time, she got to thinking about Grandin’s areas of expertise— animals, autism, communication— and decided that everything in her life coincided with them. 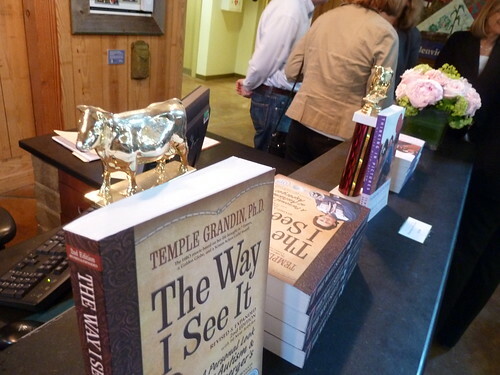 So she called Dr. Grandin up in Colorado and left a rambling message, asking for any insight she could offer into the troubles she was experiencing. 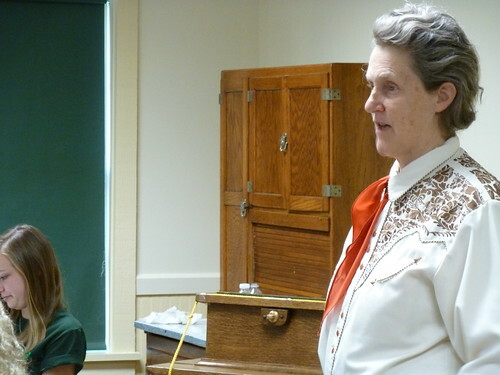 Grandin called her back within an hour to offer her insights, and was made even more interested in our 4-H program because of the problems we had experienced with animal rights protesters last year. 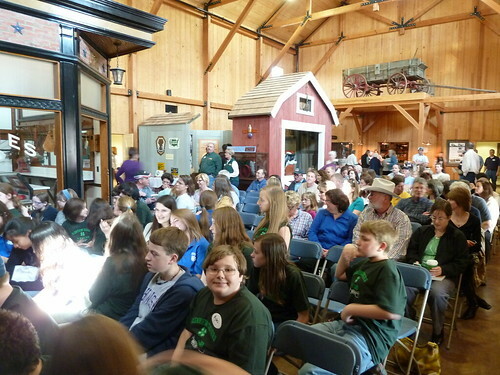 Grandin plainly believes that getting more kids involved in 4-H is the solution, not the problem, to animal rights issues, and that protesters like we had need to be confronted head on with a positive message about the program— and, by extension, the reality of a meat-eating world and how to make it decent toward animals. 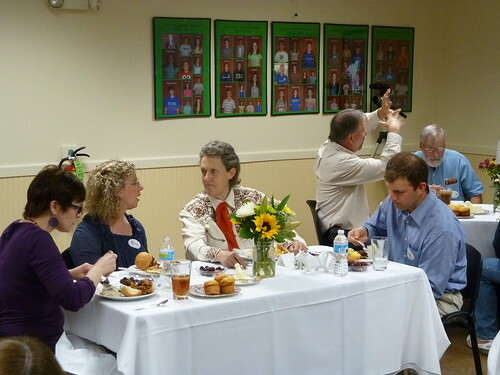 The luncheon was a private talk, largely addressed at the farmers and other supporters of our 4-H program, and Dr. Grandin requested that its content be kept private. But I don’t think I’m giving anything away by saying it basically followed her stated philosophy about the meat industry in her books, which in the Facebook and YouTube age basically amounts to— meat’s a necessity and a reality, so don’t be afraid to show the public what you’re doing… and if you are afraid to show it, maybe you need to change what you’re doing so you aren’t. Grandin is, in a sense, an industry insider, but she’s incapable of being co-opted by the industry; she’s the voice for a personal view of the ethics of animal treatment which she has forced on a vast industry by sheer force of will and intellect. And we heard that voice, oh yeah. As good as the HBO movie about her is, just by the nature of the medium, you’re put in her perspective as she fights the industry as a young woman to be heard; you internalize and sympathize with her viewpoint as she harangues stick-in-the-mud dumbasses who screw up her solutions and get animals needlessly killed in a pesticide dip. But when she’s speaking to you directly in real life, my friend, you are the thick-headed one who just doesn’t get it yet. I don’t mean that she’s rude or contemptuous as celebrities can be, not at all— in fact, she’s a surprising advocate for old-fashioned manners and respect, and credits her somewhat strict 1950s upbringing with a big role in helping her function and be successful. (I suspect clear rules of conduct are a help for someone without an intuitive sense for the subtleties of human interaction.) It’s just… she’s the cow and your question is the fencepost that needs knocking down, I think. And she heads straight for it. Which made her address to the kids (and the general public) afterwards all the more surprising. Having gotten used to the idea that she had one way of interacting, she was suddenly much warmer and friendlier with the kids. Admittedly, on a relative scale I’m sure she’ll seem blunt about certain realities that may seem too harsh for kids to handle (but not 4-H kids); her work, after all, is built on facilitating slaughter, and even though she was talking about how to show your animal at the fair, you didn’t long forget where she got all this insight about how to make animals do what you want them to do. 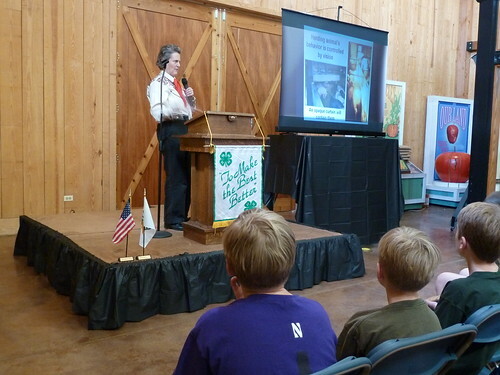 But she presented to kids wanting to know how better to treat their animals in an entirely different way than she had to the adults in the meat business. And listening to her, there’s something almost magical about her understanding of animals. We’re used to people putting human emotions into animals, every cartoon ever made has done that for us, and even the most serious-minded of animal authors, like Jack London, has been unable to completely escape putting human thoughts and feelings into the animal mind. Grandin does something entirely different— she helps us understand the animal as machine, takes the often puzzling outward signs of animal behavior and explains the syllogisms that produce them. (If A is in my path and reflecting light, I must have response B, flight.) In some ways it strips away the sentimentality of our relations with animals— and as a dog lover secretly convinced that my dog understands English and would express his devotion to me in full sentences if only he could form words with his tongue, this can be a little hard to accept. 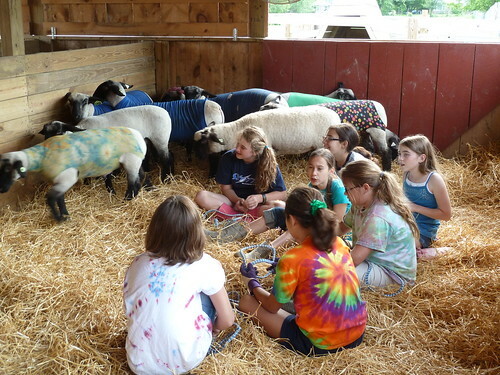 But it comes with a great gift which these kids, the dedicated and thoughtful kids of 4-H, accepted hungrily— actual insight into your animals’ behaviors and feelings. The cool logic and honesty of her explanation of animal behavior is bracing. I especially liked what they used to prop up her books at the signing. Myles gets his copy of Humane Livestock Handling autographed. A question from the audience. 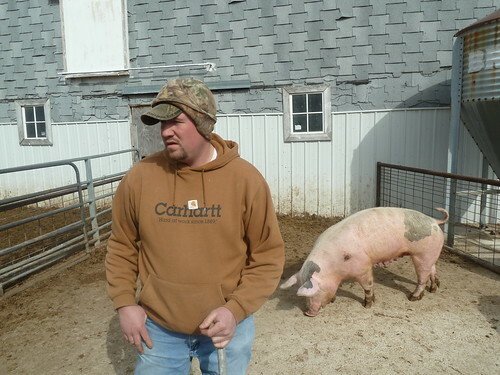 After Swine Management 101, our next pig-season adventure also began with a long drive into farm country, but this time south to Buckingham, Illinois, and in the bright daylight of Sunday morning. 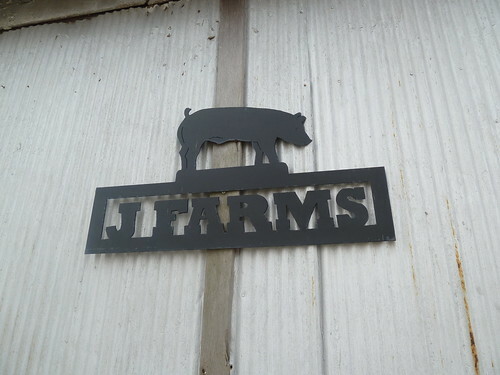 It was a sudden, wrenching shift from the broad expressway to the perfectly straight and narrow country road that took us ten miles on a grid of farmland to, suddenly, J Farm. 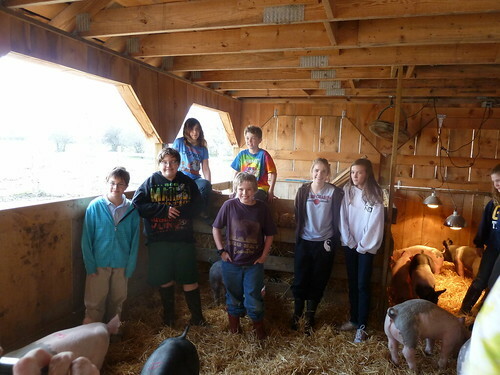 Our purpose: Meet Your Pig. 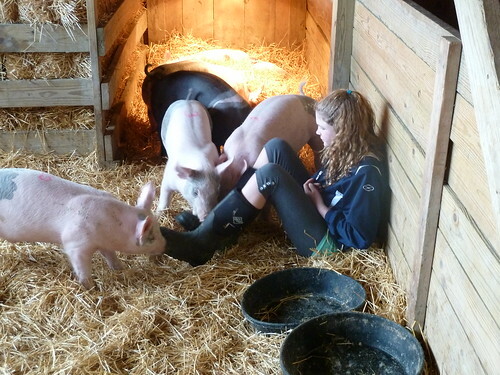 Or at least, play with the piglets, one of whom might be our pig. 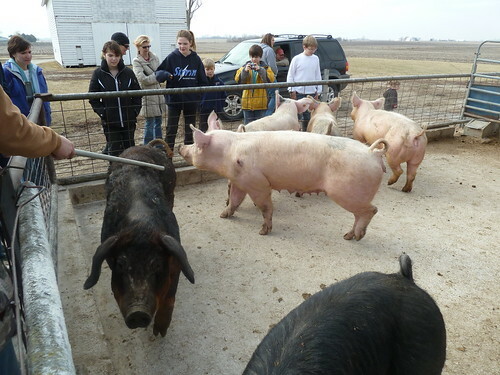 We will buy a pig at auction, sometime in April, but for now it’s just a matter of the kids getting familiar with the kind of animal they’ll be responsible for. The kids had an hour or so of sheer kid-piglet delight. The pigs, though skittish about the large humans moving about their pens, were insatiably curious, and took to chewing at shoelaces. What in a pig’s diet resembles a shoelace, I wonder? 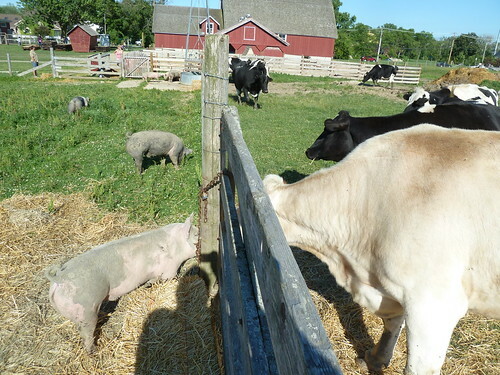 The farmer’s wife had a new baby in her arms and a toddler girl, who moved among these animals only slightly smaller than herself as if every human naturally grows up among a herd of little pink piggies. Which, not that long ago, they pretty much did. 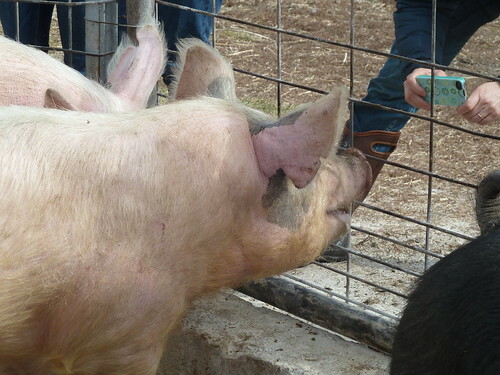 When she was done with pigs, she turned to the first adult she saw, and asked me to be airlifted out of the pen. 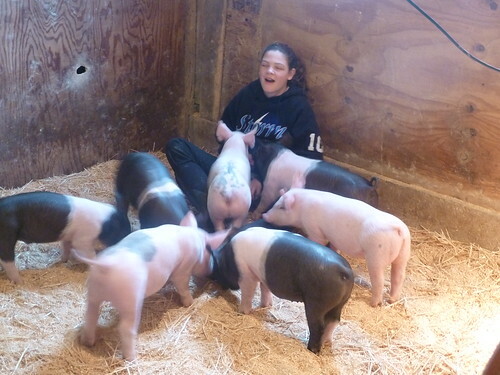 Then we drove about a mile to another farm in the Foltz family— to see the adults from whom these piglets issued. It’s not like I haven’t seen pigs before, but it was kind of a shock after our piglet interlude to be reminded just how massive and alien fully grown pigs can be. 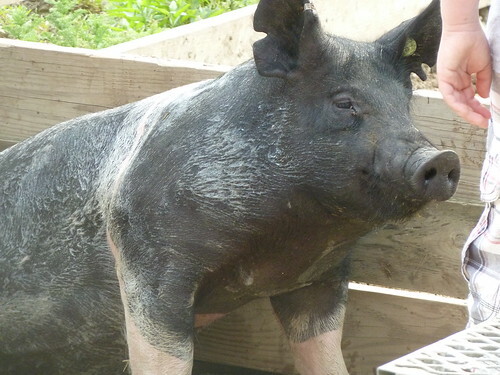 Weighing six or seven hundred pounds each, huge, brute and powerful, going from the piglets to these pigs was like going from a hamster to a hippo. And where the only danger the piglets posed was to shoelaces, here we were reminded that fingers were best kept well out of snacking range. There was nothing hostile about these pigs, but just their size sent a signal of menace to the deepest parts of the brain. 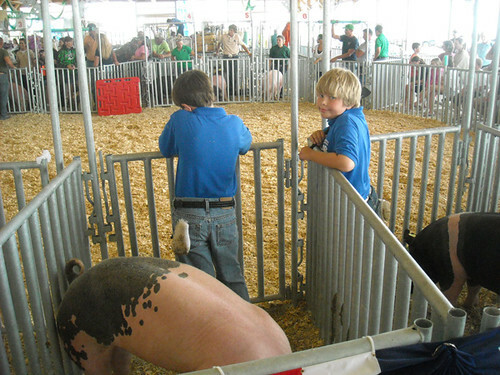 Now I’m curious, when will the moment come when my sons’ attitude toward their pig shifts from the adorable playfulness of this day with the piglets to the determined control a farmer needs to have to manage an animal of this size? When will the idea of selling this creature for meat seem natural, as it certainly didn’t as we played with the pigs today? 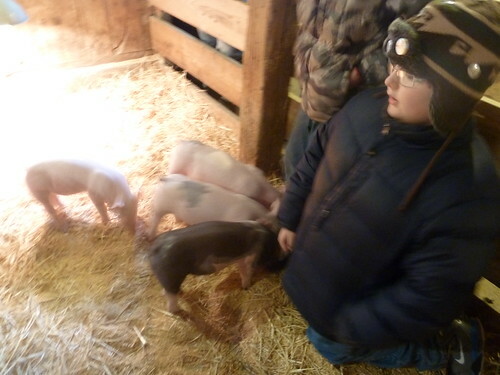 Here’s a video of the kids, including Liam, playing with the piglets. It’s not edited and nothing really happens in it. 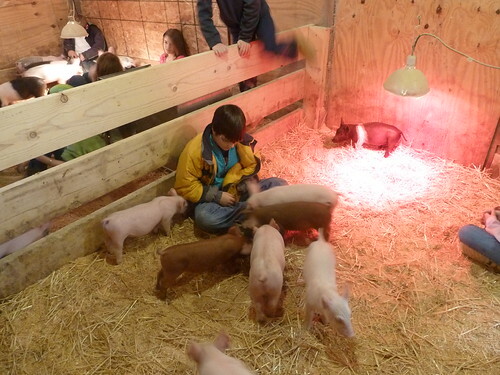 It’s just kids and piglets. Enjoy. 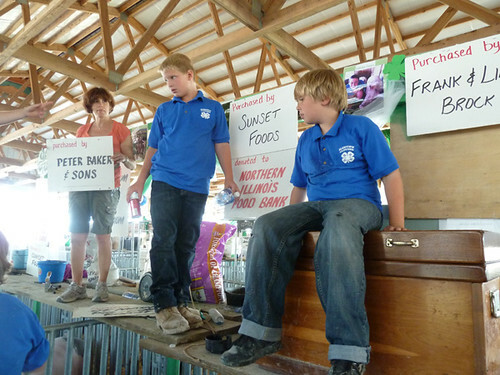 My sons have done 4H for three years. 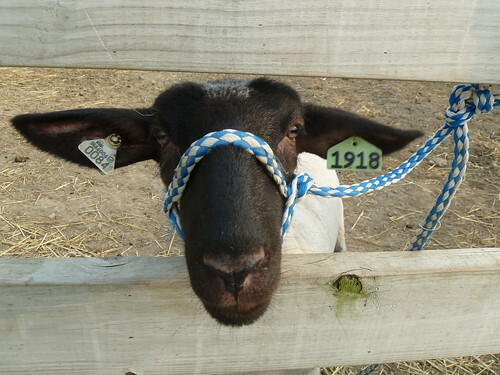 This despite the fact that we live in the heart of Chicago, which always prompts a chuckle from the auctioneer at the Lake County Fair when we show our lamb (“Not sure what kinda farms they got in Chee-cawger”). 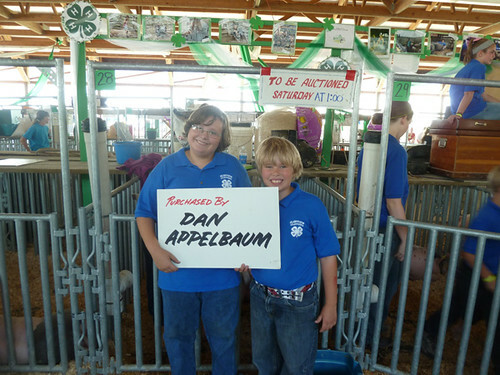 But they fell in love with the idea of raising an animal and winning ribbons for it many years ago, and as participants in the 4H program at Wagner Farm in Glenview (the last working farm in Cook County, now run by the park district) we have raised, and yes turned over for slaughter, three lambs, Triskaidekaphobia, Arachnophobia, and Ewe2. 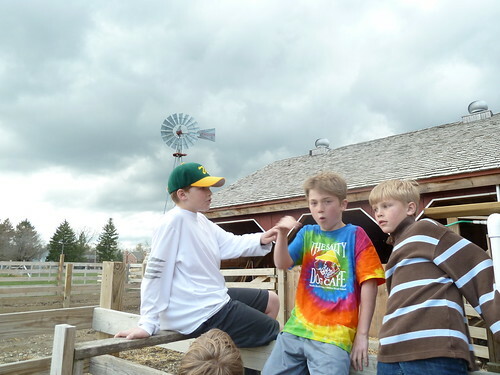 (Who was neither a ewe nor our second lamb, but the boys had just discovered rock and roll that year.) You can see some of the history of our experiences raising lambs in these videos— and in the accompanying story about protesters at Wagner Farm; not everybody is happy to keep a little piece of agricultural reality alive in Cook County. This year they’re going to raise a pig. And because this is qualitatively different from raising a lamb, for reasons some of which will begin to be stated below, and the year promises to have several interesting features to it (including one very interesting guest speaker next month), I’ve decided to keep a chronicle here of our adventures with our pig from now until the fair in at the end of July. To read them all, click the “Our Season of Pig” link under Categories at right. Here’s the first one. “Pigs are better. 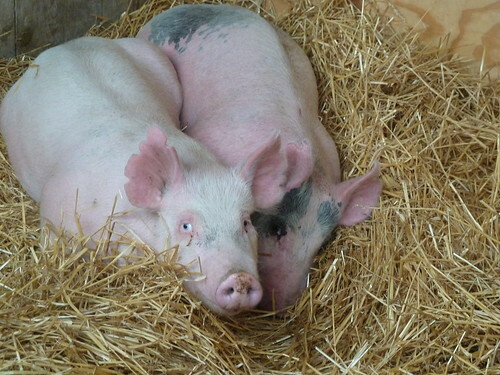 Pigs are smarter than lambs,” one of the girls in my car says. “A crust of bread is smarter than a lamb,” another girl says. Our destination is Woodstock, Illinois, which in daylight looks exactly like its quaint small-town self in the movie Groundhog Day, but at night is a dark void without feature or especially clear road signage. Finally with the help of a couple of phone calls, we find the McHenry County Fairground and I take the last parking space in the front lot, which requires driving my Prius up a mound of snow and leaving it parked nose in the air at an angle, like a pickup truck in an ad. Which is ironic since it’s about the only vehicle in the entire lot that isn’t a pickup truck. I’ve never felt as much of a fraud in 4H as I do at this moment. 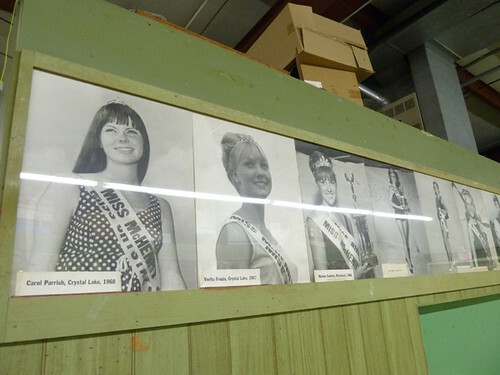 We find the door and enter the large hall, which is painted a shade of green last seen on wood-paneled station wagons, and enter under the watchful eyes of past fair queens. 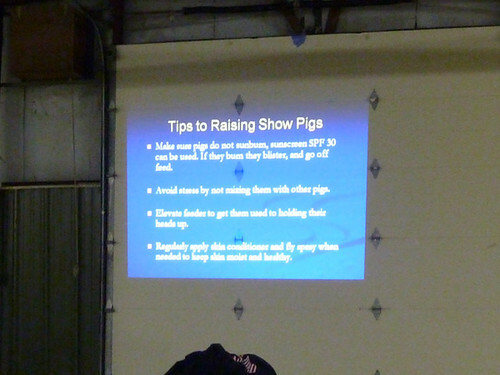 We are here for Swine Management, which is a required annual course for anyone raising a pig to show at the fairs in the state of Illinois. (There’s also an online test in ethics, which is good for life— not necessarily the most effective choice when it’s being mainly taken at the age of 10. This may explain a lot about the pretty awful state of industrial pork production.) The girls in my car, who’ve taken Swine Management before, have helpfully explained that it is the most BORING thing on earth, and the setup— a Powerpoint presentation given by a man with no P.A. system, who surely can only be heard by half the very large room— seems designed to drive home her point. 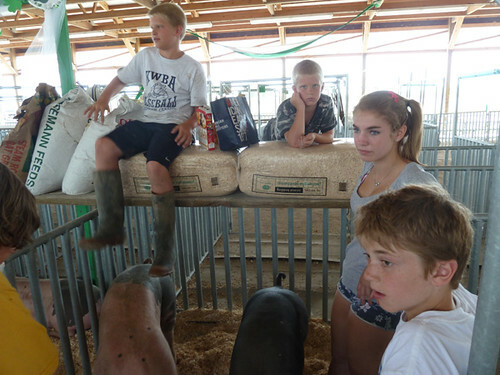 Nevertheless, the 4H kids do much better than I would expect at paying attention to a fairly arcane agribusiness discussion of historical trends in pig design, selecting pigs for maximum profit, and feeding and caring for them in a way that will score highly with the judges and bring a good price at auction. I find it pretty fascinating too, as most glimpses inside an entirely different way of life are. When I said pig “design,” I wasn’t exaggerating for comic effect. 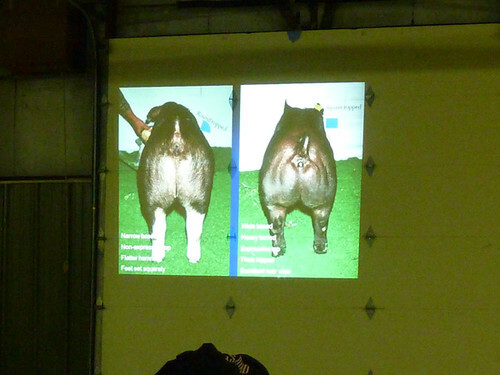 The first part of the talk is devoted to discussing the changes in pig body types over the years, which are something like the changes in cars over the same period— first round and lardy, then long and streamlined, then shorter and boxier, then more sleekly rounded around the shoulders and back legs. People who are put off by the idea of caring for an animal only to have it killed for meat act as if one day you have a pet and the next you have pork chops, but a discussion like this has nothing to do with pets— this is the pig as industrial product from the very start, selected for its efficiency as one interchangeable part in an industrial process. Except, of course, in 4H it’s not. 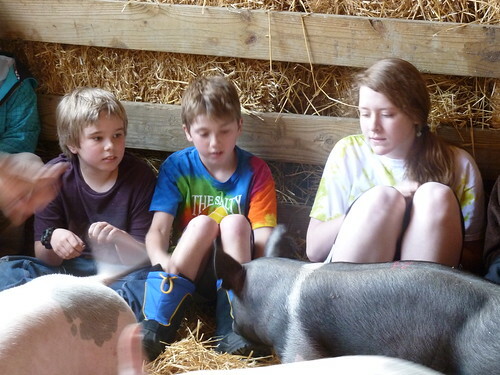 These are kids, raising one pig apiece, and I have to think my sons will form a closer and potentially more emotionally upsetting bond with this relatively more intelligent and personable animal than with the lambs who, as mammals go, were about as cold and blank as a lizard. 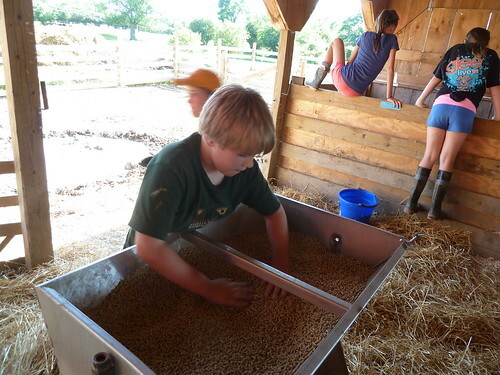 4H is creating modern farmers (in some kids, anyway, probably not in mine) by harkening back to an older way of farming that can’t really exist profitably any more. 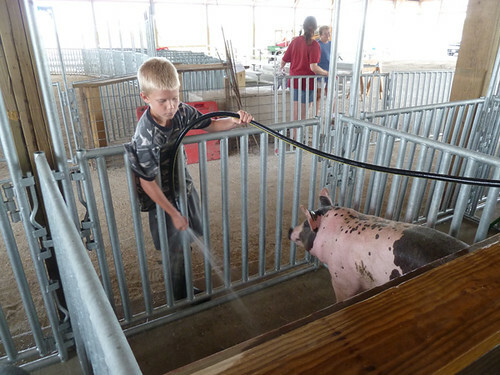 Like the ethics test, this one early experience of hands-on, personal animal husbandry will have to last a lifetime. 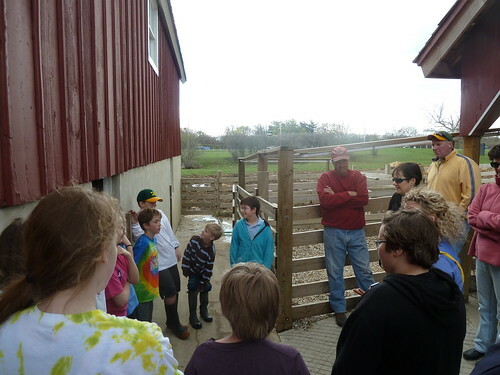 The protesters at Wagner Farm last year imagined that the kids were ignorant of what would ultimately happen with their animals. 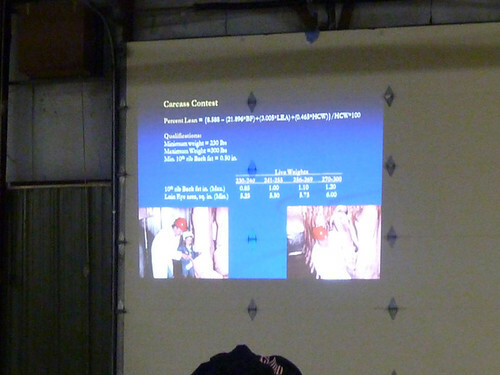 But when this slide depicting the inspection of hanging carcasses came up on screen, there was only the slightest murmur rippling through some of the younger kids in the crowd. 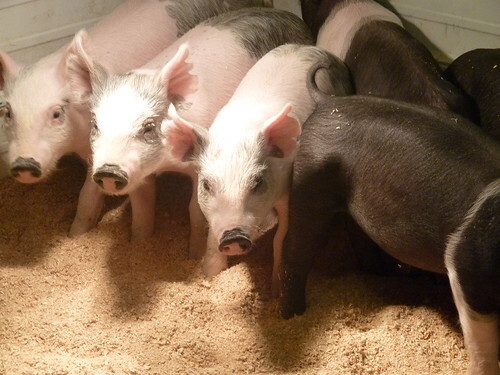 Pigs are business, pigs are meat, and everyone here knows it, no matter how young they are. 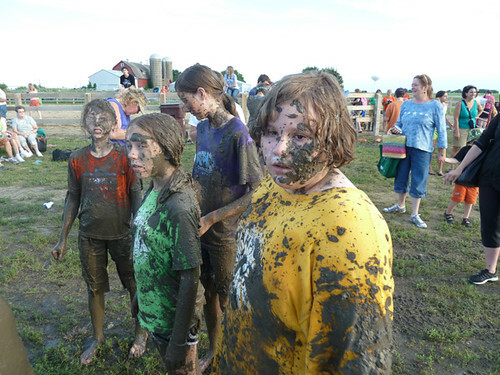 That’s the first difference between farm kids and city ones. After the presentation, we went to the McDonald’s across the street, and the kids hungrily scarfed down the epitome of industrial food while talking eagerly of the season of the pig ahead. Myles, deliberately making his deranged Children of the Corn face.